Transitional Deacon Martin Rodriguez received a special Christmas gift a few weeks before the celebration of Christ’s birth when he was invited to assist Pope Benedict XVI during a Christmas Eve night Mass at St. Peter’s Basilica at the Vatican. Six deacons assisted at the Mass. Deacon Rodriguez, a member of St. Mary Parish in Indianapolis, was one of two to remain at the pope’s side during the entire liturgy. Deacon Rodriguez emigrated to the United States with his family when he was a child. In an e-mail interview with The Criterion, he said that he never could have imagined when he became a seminarian eight years ago that he would eventually assist at a Christmas Eve Mass with the pope. Although Deacon Rodriguez has been in formation in Rome for four years, this was the first time that he actually spent Christmas there. 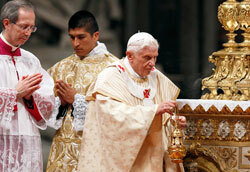 Serving alongside the pope made it special for him. So did a trip his brother, Victor, made to spend the holiday with him in the Eternal City. Among those who watched the Mass were his family in Indianapolis and fellow St. Mary parishioners.